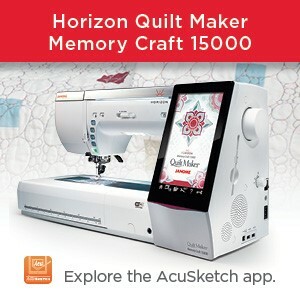 ← GLAD YOU ASKED THAT: What is AcuStitch Tool and what is the NEW AcuStitch software? 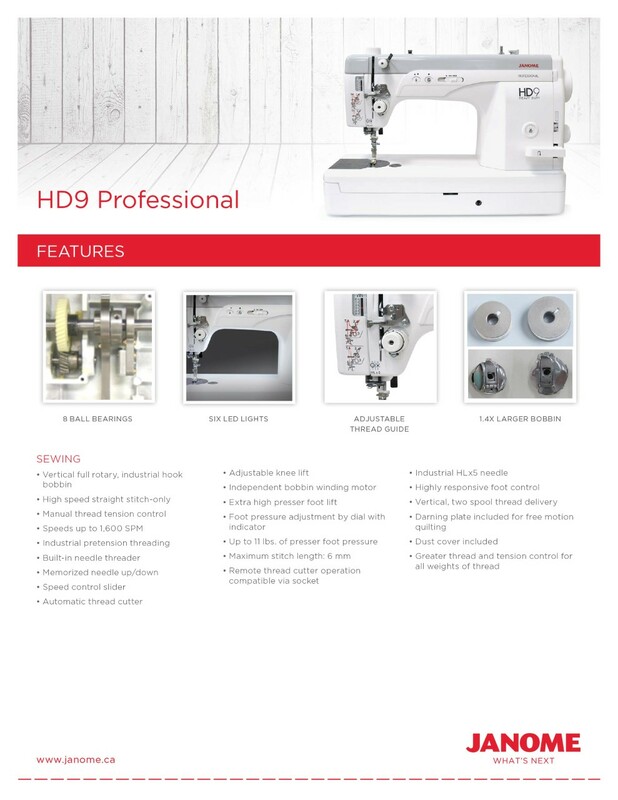 From a professional elegance to its exceptional robust quality, the HD-9 sews all kinds of fabrics, thin or thick. 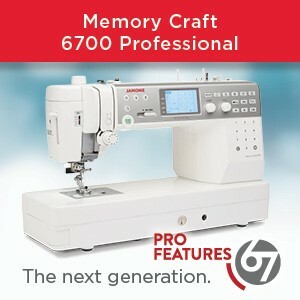 The HD-9 sews straight stitches only but there are several accessories to perform different precise techniques with straight stitching. By the way – HD stands for HEAVY DUTY! This can sew effortlessly through multiple layers of leather, vinyl. cork, denim, canvas and more …… AND you can also quilt and sew soft fabrics too! The machine comes with all the necessary tools to start your first project. It is a sewing principle that the length of the stitch should be compatible with the weight of the thread and fabric. I tested threads ranging from 60 to 30 – on thin and very heavy fabrics…. The HD9 handled it all very well…..No worries whatsoever! 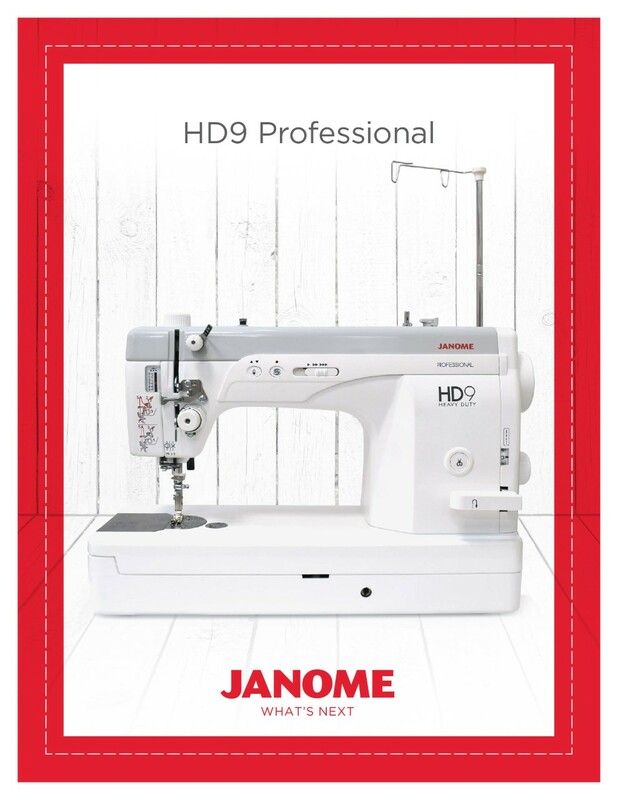 Elegant and fast, the HD9 in the professional series of Janome is perfect for sewing and quilting. You’ll find everything you need to make projects quick and easy. 2. Two different threads: for regular threads and for heavier weight threads. 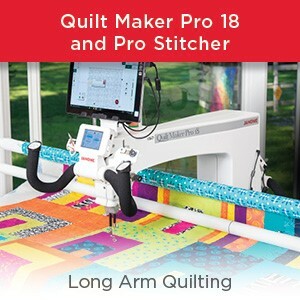 Creates the perfect narrowing of a sewing point without having to adjust the tension when using heavier weight threads. Stabilizes the tension of the thread when sewing through thick fabrics such as leather, cork, upholstery, outdoor fabrics and other heavy fabrics or materials. 5. The top of the needle is round, the eye is sideways and the threader is integrated. 6. When sewing with an average weight thread, the automatic thread cutter is accessible via the thread cutter button. For the larger gauge threads, this is not a problem either with the new Heavyweight thread Guide. Visit the authorized Janome dealer in your local area to test this superb and robust Janome HD-9! Originally Published on Vie Janome March 6 & 9, 2019 By Celine Ross. Translated and edited by Anne and Liz. Ed: Now that Celine has completed her testing phase with this machine, she says she is working on a genuine leather bag ……coming soon we hope. And Liz has a lovely laptop tote (thick wool felt, vinyl and cork) sewed exclusively on the Janome HD9 to share with you next week ….. so do stay tuned! And we have several educators and artisans currently working with the NEW HD Roller foot featured here earlier this month. As soon as we have had time to put this foot through its paces, we will share the goods with you. 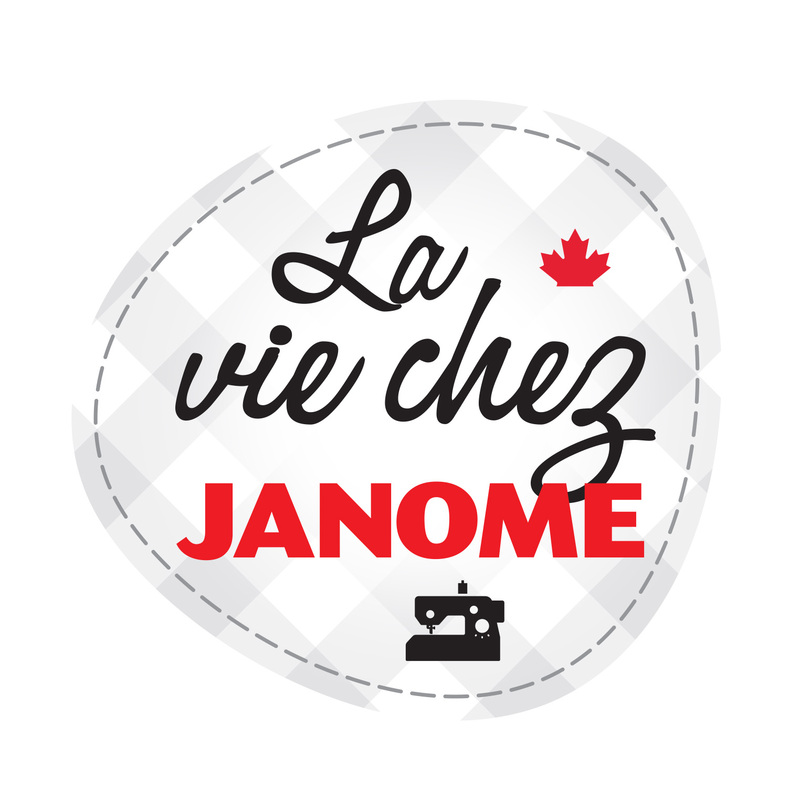 This entry was posted in Janome Professional HD9 and tagged Janome HEAVY DUTY sewing, Janome Machine Model of the month, Janome Professional HD9, Janome sewing on leather, Janome straight stitch sewing, NEW Janome HD Roller foot. Bookmark the permalink. I still dont understand what is the difference between the hd9 and the 1600pqc. Would it be worth it for me to upgrade? On this Machine of the month post, you will find a list of all the features of this machine so you will be able to compare with the now discontinued 1600P. The main differences would be: better LED lighting; a dual system of threading: one for regular thread and the other for thicker, heavier thread for applications like sewing upholstery, leather, vinyl etc. And the bobbin is much larger: 1.4 times the capacity of the previous bobbin. It also has new Janome professional series styling with impressive platinum colour. The HD9 replaces the 1600P which we have had on our Jnaome line for many years. Both the HD9 and 1600P are straight stitch only models while your HD3000 is a great heavy duty model which also offers some utility stitches. Excellent. We love to hear that! So how big is the throat? It has a 9x 6 inch work area/throat space.